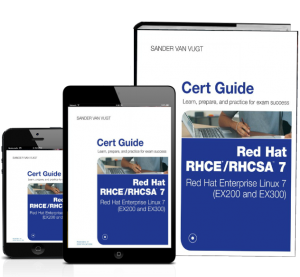 This guide has one single goal: to help you pass the newest versions of Red Hat’s RHCE® and RHCSA® exams for Red Hat Enterprise Linux 7. From start to finish, this guide is organized to help you focus your study time where you need the most help, so you can retain more, and earn higher scores. This guide is an ideal printed complement for those studying with my RHCSA® Complete Video Course or RHCE® Complete Video Course.